An Apache woman named Darcia Tafoya, from Jicarilla, New Mexico, taught me this figure at the St. Louis Exposition. First: Hold the left hand with the fingers pointing obliquely upward and away from you and with the palm facing toward you and upward. 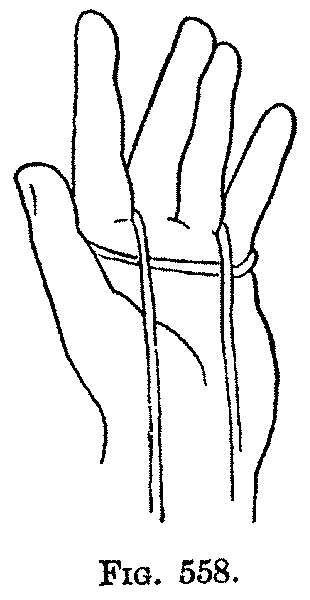 With the right hand lay a part of the loop across the palm, and let it hang down on the left side, between the thumb and index, and on the right side from the right side of the palm. 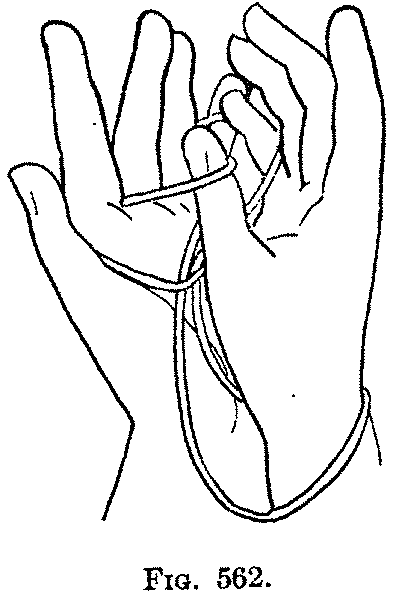 With the right thumb and index pick up together near the back of the left hand the two hanging strings, and bring them up toward you to the palm of the left hand, by passing the left string between the left index and middle finger, and the right string between the left ring finger and little finger (Fig. 557); and let the two strings hang down on the palm. Observe that they cross over the palmar string (Fig. 558). 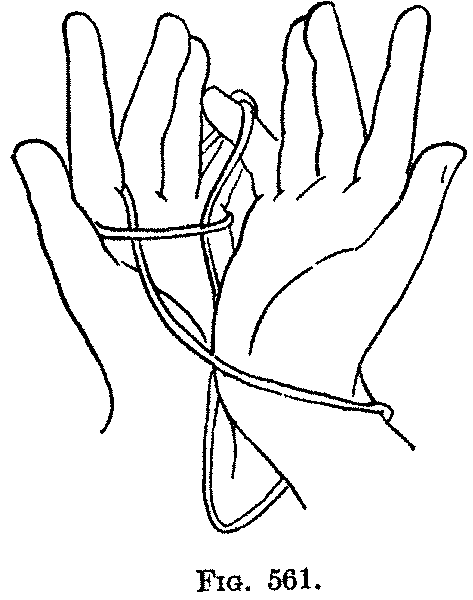 Second: Pass the index of the right hand under the left palmar string, and hook the end around the two hanging strings, and draw them down under the palmar string (Fig. 559); let them hang down on the left palm. 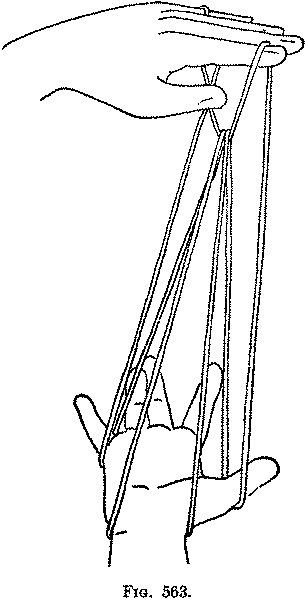 Observe that now the palmar string crosses over the hanging strings (Fig. 560). Third: Put the right hand from the left through the far side of the hanging loop, and keep the loop on the right wrist. Put the little finger of the right hand, from the right side, under the right hanging string, above the palmar string (Fig. 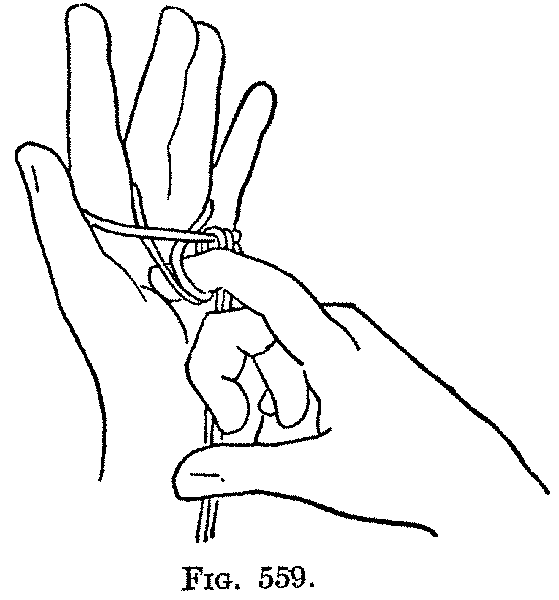 561); and put the right thumb, from the left side, under the left hanging string, also above the palmar string (Fig. 562). 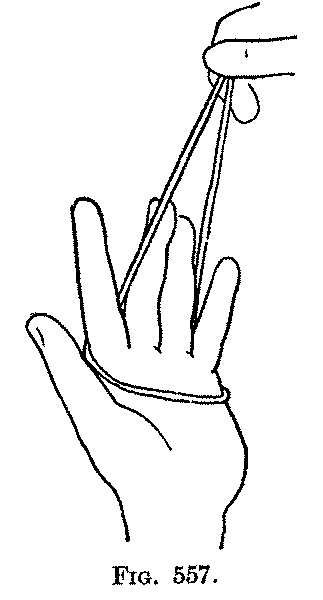 Draw these strings out on the right thumb and little finger, keeping the loop still on the right wrist (Fig. 563). The "Teepee," or tent, is formed by swinging the right hand down, palm upward, with the fingers pointing away from you; and by elevating the left hand, and turning the palm down and pointing the fingers to the right. In this figure the hand which arranges the strings on the other hand in the end takes up some of the strings to form the most important part of the finished pattern.